This is part of an introduction to our Argumentation unit using Homer's "The Odyssey" and other poems and songs. 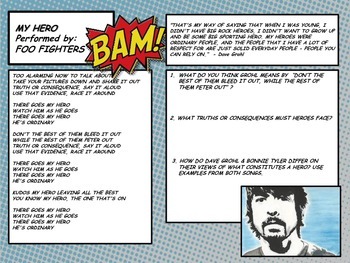 Students read the song lyrics & watch the music videos of this and two other songs relating to heroes to discuss the question "What constitutes a hero?" They discuss how this songwriter and Bonnie Tyler ("I Need a Hero") would differ in their answer to the question of what constitutes a hero, while citing textual evidence for support. I made this form to work with our Interactive Student Notebooks.